This past summer the Montclaire school community was privileged to have Morgan Mural Studios create a California landscape mural on our campus. It is a pleasure to recommend Morgan Bricca for hertalent and her professionalism. Ms. Bricca was terrific to work with. She coordinated throughout the process with a parent project leader from our PTA and upon their first requirements. We refined the details a bit and then Morgan went to work. She is incredibly fast! The wall literally unfolded in front of us in a week’s time. Ms. Bricca’s mural creation has transformed our kindergarten area where it spans two classroom walls as well as two sitting alcoves. The area is so different now that it is difficult to recall what it once looked like. Morgan has brought the beauty and essence of our surrounding environment directly onto our campus. She effectively rendered a natural setting that is relevant to all of our students. The younger students love to count the butterflies and name all the animals. The older students comment that the wall looks “cool” and they are curious as to how she achieved the amazing perspective of mountains in the distance. The new mural has been a subject of much conversation now that school is back in session. We have received a tremendous amount of positive feedback and our community has been enriched by Ms. Bricca’s talent and her ability to hit just the right notes to craft a mural perfectly suited to our school. We are delighted to recommend Morgan Bricca and would highly encourage others to consider her for their next art project. 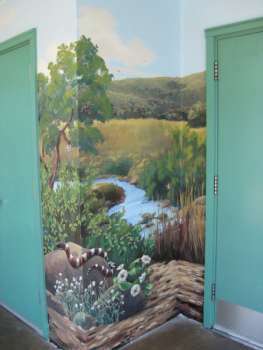 View detailed photos of the California wildlife mural Morgan painted for Montclaire Elementary School.